Meyer Tool Renews ASME U Stamp and National Board R (Repair) Stamp Certification - Meyer Tool & Mfg. Every three years Meyer Tool undergoes an extensive two day audit of our ASME Quality Control System implementation to receive reauthorization of our ASME U Stamp and National Board NB and R Stamps. The U Stamp is our authorization to manufacture pressure vessels, both at our fabrication facility and in the field, in accordance with the applicable rules of the ASME Boiler and Pressure Vessel Code Section VIII Division 1. 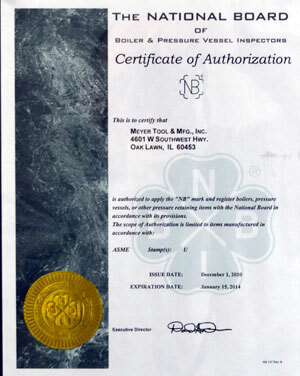 The National Board NB Stamp is our authorization to apply the “NB” mark and register ASME U stamped pressure vessels with the National Board of Pressure Vessel Inspectors. The National Board R Stamp authorizes us to perform metallic repairs and/or alterations of pressure vessels, at our fabrication facility or in the field. Between audits, all of Meyer Tool’s ASME and National Board related design and fabrication activities are monitored and individually audited on every project. This oversight is performed by an independent outside ASME/NB certified Authorized Inspector (AI). The AI is provided by an independent Authorized Inspection Agency, in the case of Meyer Tool, HSB Global Standards. The AI has access to all drawings, calculations, specifications, procedures, records, test results, codes and any other documentation he requires to perform his duties. The AI has free access to Meyer Tool facilities and may designate hold points anywhere in the fabrication process. Since 1916, ASME has certified companies in industry to build pressure vessels and components that comply with the ASME Boiler and Pressure Vessel Code (B&PV Code). 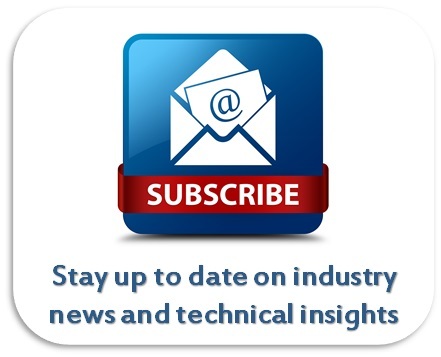 The ASME B&PV Code establishes rules governing the design, fabrication, and inspection of boilers and pressure vessels, and nuclear power plant components during construction. 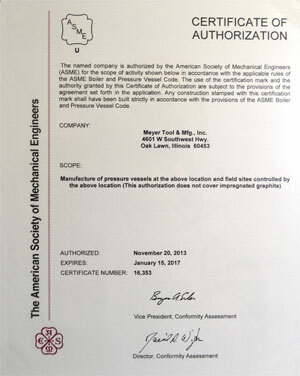 The ASME certification mark, regarded as the hallmark of acceptance and certification, is used to indicate that a stamped item conforms to the latest edition of the ASME Boiler and Pressure Vessel Codes. The U Stamp that Meyer Tool holds is for the fabrication of pressure vessels and components to the requirements of Section VIII Division 1 of the B&PV Code. Utilization of the ASME certification mark is a means of complying with the laws and regulations of all 50 states in the U.S. and also in all of the provinces of Canada. According to ASME, only about 5800 companies in 70 countries are currently certified by ASME. Whether or not an ASME Code Symbol Stamp is legally required, it provides users with a high degree of confidence that the stamped item conforms to established safety standards. Generally the reauthorization audit takes place a month or more in advance of the expiration of the current certificates. In our case, this meant the audit occurred shortly before the Christmas holidays. Tony Vouris, Senior Project Manager at Meyer Tool, was our audit representative. Tony has overseen our ASME audits for more than a decade and is extensively involved in design and fabrication activities related to ASME Code pressure vessels at Meyer Tool. The audit team consisted of three National Board Certified Authorized Inspectors, Mr. Dewey Anglin, Team Leader, from the National Board, and two HSB Global Services representatives, Mr. Jeremy Bowers, Supervisor of Inspection Services, and Mr. Todd Ward, Authorized Inspector. During the first day of the audit, the audit team privately reviewed Meyer Tool’s ASME quality control manual for compliance to the latest edition of the ASME Code. With the exception of some minor grammatical changes, the manual was approved without edit. Meyer Tool immediately updated all copies of our quality manual so it could be signed off by our Authorized Inspector within the time frame of the audit process. On the second day of the audit, the audit team visited Meyer Tool’s facility. The audit team toured the facility, reviewing the status of in process ASME pressure vessel projects. Special attention was paid to the implementation of Meyer Tool’s system for maintaining material traceability throughout the project fabrication processes. All elements of the quality system were reviewed; the audit team followed a checklist consisting of 16 elements related to ASME certification Quality System requirements. Each element was reviewed for both written practice and implementation. As we expected, we passed each of these reviews. During the same day exit meeting, the Lead Auditor, Mr. Anglin, informed us of his recommendation that Meyer Tool be reauthorized to utilize the U, NB and R stamps. No deficiencies were noted by the audit team. 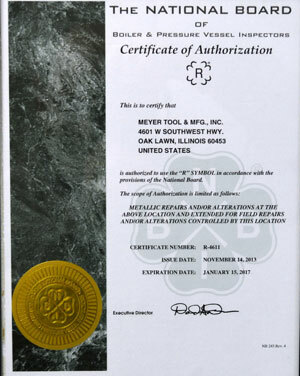 Meyer Tool has subsequently received our new Certificates of Authorization from the ASME and from the National Board and we are certified for another three years. The Management at Meyer Tool would like to congratulate our engineering and manufacturing teams for continuing to correctly implement our ASME Quality System and for passing yet another triennial audit without deficiencies. We at Meyer Tool consider ourselves to be Specialists in Cryogenic, Vacuum and Pressure Technologies. 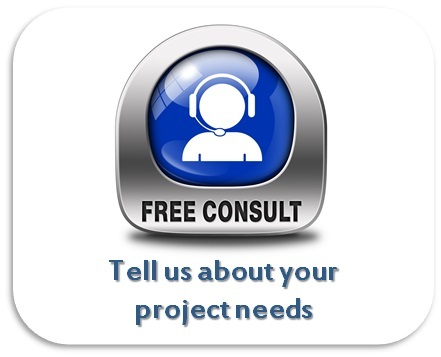 Experienced engineering and manufacturing personnel performing ASME Code U Stamped design and fabrication services utilize processes to Reduce Project Risk and achieve the lowest total cost of ownership for our customers. Trouble free audit activities reflect the quality and robustness of ongoing processes and activities at Meyer Tool.